Rhodes insisted Birchwood go to college and always held the guitar spot in his band open for Selwyn whenever he was available. It was a win-win situation, as Birchwood – through hard work and scholarships – received his MBA from The University of Tampa. “I challenged myself to get that degree,” Birchwood says. 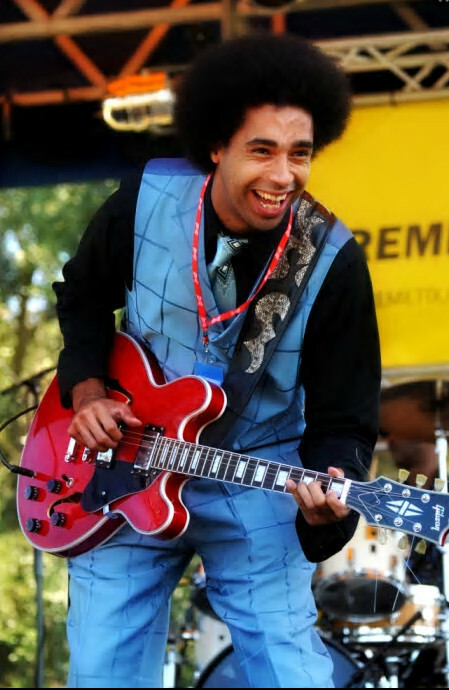 “These days, it’s not good enough to just be a good player.” Combining the musical lessons learned from Rhodes and his business acumen, Birchwood, now living in Tampa, formed the current version of The Selwyn Birchwood Band in 2010. The band, with the same members still together today, features veteran musicians older than Selwyn, testifying to Selwyn’s musical chops and his leadership skills. On stage, they play off each other with ease, feeding each other energy, sharing the fun with the audience. Ben Prestage’s musical background began before he was born… even before his parents were born. Ben’s great-grandmother was a Vaudeville musican who toured with Al Jolson and also participated in medicine shows. Her daughter was a Boogie-Woogie pianist and painter who used to play for Ben when he was coming up. On the other side of the family tree, his grandfather, who was a Mississippi sharecropper turned Ben onto the sounds and culture of Mississippi and Blues in general. Ben’s interesting approach to instrumentation, (fingerstyle guitar, harmonica, banjo, lap-steel, fiddle, resonator guitar, foot-drums, vocals, and his award-winning original songwriting (recipient of “The Most Unique Performer” at “The Song- writers’ Showcase of America”) has earned him invitations to perform across North America, Europe, and as far as North Africa. All awards aside, he has proven himself, through his live performances, to be the future of American Blues, Roots Music, Americana and is one of today’s most talented outsider. Johnny Debt’s, one-bum-band, is the product of a history studying, dead-end job worshipping, heartbreak-loving, semi-sober, down-and-out-country-boy. The,”Florida-Balladeer” hails from Indiantown, FL. Johnny, eases his pain by writing about his personal hardships and his love for the crazy state of Florida. His music is steeped in the, one-man-band, tradition of his big-brother, Ben Prestage. Johnny began touring the world with the Prestage Brothers as a multi-instrumentalist and songwriter in 2015. Debt, has written over 100 original songs over the past two years, and is currently wrapping up the Prestage Brothers debut album, and his debut solo album, “Guilty” will be released summer 2017.